WASHINGTON (Army News Service) -- If sequestration continues in fiscal year 2018, active protection systems for Army aircraft will remain a top priority, said the Army's chief resource officer. "We haven't reached that point yet. Hopefully, we won't," said Lt. Gen. John M. Murray, the Army G-8. "But I would prioritize active protection systems for our aircraft. There are threats out there right now [for which] we just need to develop some new technologies -- and we are -- to provide protection for our aviators. I'd put that as No. 1." Active protection systems, which the Army wants for both ground vehicles and aircraft, provide combat vehicles with automated protection against armor penetrators and direct-fire threats, such as rocket-propelled grenades and anti-tank guided missiles. Both Murray, and Lt. Gen. Joseph Anderson, the Army G-3/5/7, testified March 16 before the House Armed Services Committee's subcommittee on Tactical Air and Land Forces on the effects of sequestration and continuing resolutions on Army modernization and readiness. Beyond the prioritization of active protection systems, he said, sequestration would pose a challenge to prioritizing modernization for Army aircraft like the AH-64E Apache, the UH-60M Black Hawk or the CH-47 Chinook Block II. 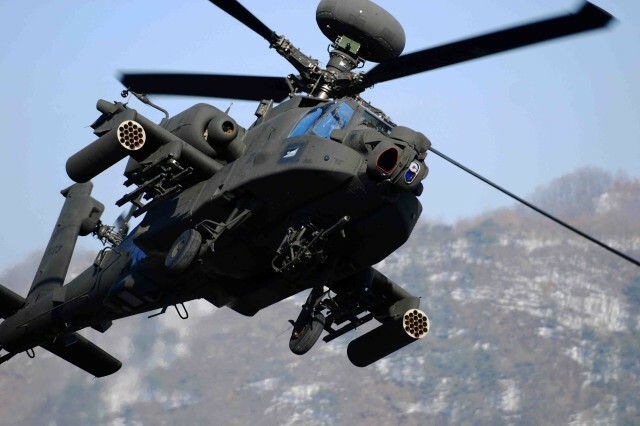 Priorities for divestiture under sequestration, he said, include the aging OH-58 Kiowa aircraft, the TH-67 Creek trainer, and the UH-60A Black Hawk. Additionally, he said, as the Army moves to Block II of the CH-47 Chinook, the Army expects to divest itself of older models of that aircraft. Both Murray and Anderson told lawmakers that continued sequestration and the unpredictability of funding that comes with continuing resolutions have a continuous and compounding deleterious effect on both Army modernization and Army readiness. Anderson said the effects of continued sequestration reduces training dollars and decreases the level of training proficiency that can be achieved within a brigade and battalion, requiring the Army instead to train up only to the platoon and smaller levels. Lack of training dollars, he said, reduces combat training center rotations, decreases mission command training programs, and reduces seats in schools where the Army teaches Soldier skills. Instead, he said, the Army would only be able to focus on maintaining readiness within units that are going after "named operations," such as Freedom Sentinel, Inherent Resolve, or for maintaining the readiness of the global response force. Murray said if sequestration comes back in 2018, it would affect the Army's modernization of the Abrams and Bradley. Murray told lawmakers the Army now has half the funding for modernization and equipping the force that it had just eight years ago. Sequestration, he said, as well as years of continuing resolutions in the absence of a budget, has forced the Army to put resources into keeping Soldiers ready for the current fight and to forgo modernization that would provide future Soldiers with the tools they will need to fight. "We find ourselves in a situation where our most capable enemies are closing quickly," Murray said. "We are losing overmatch in every domain: land, air, maritime, space and cyberspace." After years of only being able to sustain, maintain and improve existing combat systems, Murray said, the Army must start developing future weapons for future fights. "I believe we have reached a point in time where we can no longer afford to do just one or the other: improve existing systems or develop new ones," he said. "We must find a way to do both."